The official weigh-in for Saturday’s WBC Heavyweight world championship clash between undefeated world champion Deontay Wilder and undefeated WBC number eight rated Heavyweight contender Gerald Washington, which will headline the latest edition of the Premier Boxing Champions series took place earlier today in Birmingham, AL. The official weights for the entire card are as follows. Main Event: WBC Heavyweight world championship – 12Rds. Deontay Wilder (Champion) 222lbs. vs. Gerald Washington 239lbs. Vacant IBF Jr. Middleweight world championship – 12Rds. Tony Harrison 153 1/2lbs. vs. Jarrett Hurd 153lbs. Dominic Breazeale 263lbs. vs. Izu Ugonoh 230 1/2lbs. Vacant United States Boxing Council (USBC) Middleweight championship – 10Rds. Kenneth McNeil 158 1/2lbs. vs. Alantez Fox 159 3/4lbs. Tugstsogt Nyambayar 127 3/4lbs. vs. Jhon Gemino 128 1/2lbs. Caleb Plant 167 3/4lbs. vs. Thomas Awimbono 148lbs. PBC: Wilder vs. Washington takes place tomorrow night (Saturday, February 25th at the Legacy Arena in Birmingham, AL. The card can be seen in the United States on Fox beginning at 8PM ET/5PM PT. A portion of live undercard bouts will take place following the main event on Fox Sports 1 in the United States, which is currently scheduled to begin at 10PM ET/7PM PT. Check your cable/satellite provider or local listings for times and channels for Fox and Fox Sports 1 in your area. In the United Kingdom, the card can be seen on Sky Sports 1 at 1AM (Sunday, February 26th Local UK Time. For more information please visit: www.skysports.com. Check your listings internationally. For more information on the Premier Boxing Champions series please visit: www.premierboxingchampions.com. The official weigh-in for Friday’s pay-per-view card headlined by the WBC Light-Heavyweight elimination bout between former IBF Super-Middleweight world champion and current number seven rated WBC Light-Heavyweight contender Lucian Bute and undefeated current WBC number one Light-Heavyweight contender Eleider Alvarez took place earlier today in Quebec City, Canada. The official weights for the entire card are as follows. Main Event: WBC Light-Heavyweight Elimination Bout – 12Rds. Lucian Bute 173 1/2lbs. vs. Eleider Alvarez* 174 1/2lbs. Eric Bahoeli 253 1/2lbs. vs. Adam Braidwood 250 1/2lbs. Francis Lafreniere (Champion) 157 1/2lbs. vs. Uriel Gonzalez 159 1/2lbs. Alejandro Torres 165lbs. vs. Dario Bredicean 169 1/2lbs. Jesus Olivares 168 1/2lbs. vs. Christian M’Billi 163 1/2lbs. Bute vs. Alvarez takes place tomorrow night (Friday, February 24th) at the Videotron Centre in Quebec City, Canada. The card will be available on Integrated Sports Pay-Per-View on cable and satellite in the United States. Contact your cable/satellite provider for ordering information. The card will also be available worldwide on the Fite TV app for $29.95. For more information on Integrated Sports please visit: www.integratedsportsnet.com. The Fite TV app is available on the Google Play Store as well as the Apple App Store. For more information about Fite TV and how to cast content to your TV please visit: www.fite.tv. Future Hall of Famer Roy Jones scored a dominant eighth round technical knockout over former world title challenger Bobby Gunn on Friday night at the Chase Center in Wilmington, DE. The fight was fought at a methodical pace from start to finish. Gunn had some sporadic success in making Jones miss and landed a couple of solid punches in the first two rounds, but as the fight progressed it was Jones who picked his shots. As the fight went on Jones found a home for his right hand on Gunn’s face. Toward the end of round seven, Jones connected with a short combination highlighted by a flush left hook to the jaw that had Gunn staggered, but Jones opted to let Gunn finish the round rather than force the action. Although Gunn survived the round, he was prevented from continuing the combat as the bell sounded for eight by his corner who informed Referee Bill Clancy that they wanted the fight stopped. Official time of the stoppage was :07 of round eight. Roy Jones advances to 65-9, with 47 Knockouts. Bobby Gunn falls to 21-7-1, with 18 Knockouts. Also on this card, in a Jr. Welterweight bout Joey Tiberi scored a fourth round stoppage over a “Game”, but overmatched Bryan Timmons. Tiberi, who was coming off of a near three year layoff, used effective counter punching and body shots to control the action. The end came when Tiberi connected with a body shot in the fourth round of the scheduled four round fight that hurt Timmons and allowed Tiberi to continue landing punches until the fight was stopped. Official time of the stoppage was 2:04 of round four. Joey Tiberi advances to 14-2, with 7 Knockouts. Bryan Timmons falls to 5-9, with 5 Knockouts. In a Jr. Lightweight bout, rising contender Frank De Alba scored a six round unanimous decision over veteran German Meraz. De Alba, who scored his fourth straight victory with the win since losing a narrow ten round majority decision to Omar Douglas in December 2015, was simply more active and landed the cleaner more effective punches to earn the decision victory winning all six rounds on all three official scorecards 60-54. Frank De Alba advances to 21-2-2, with 9 Knockouts. German Meraz falls to 55-42-1, with 32 Knockouts. In the co-main event in the Jr. Middleweight division undefeated rising prospect Kanat Islam scored a thrilling first round knockout over Robson Assis. Islam suffered a deep gash over the right eye seconds into the fight as a result of an accidental clash of heads that quickly left his face a bloody mess. Despite having a nasty gash that had to of had some impact on his vision, Islam pressed forward being more than willing to engage with Assis in what became the most exciting bout of the evening. Islam was able to send Assis down for the count with a flush right hand late in the opening round to score the knockout victory. Official time of the stoppage was 2:12 of round one. Kanat Islam advances to 23-0, with 19 Knockouts. Robson Assis falls to 16-4 with 9 Knockouts. In a Jr. Featherweight bout, unbeaten prospect Dagoberto Aguero scored a narrow six round majority decision over Olimjon Nazarov. Official scores were 57-57, and 59-55, 58-56 (In Aguero’s favor.) Dagoberto Aguero advances to 11-0, with 8 Knockouts. Olimjon Nazarov falls to 14-5, with 8 Knockouts. *A scheduled four round Middleweight bout between Edward Ortiz and Jeff Chiffens did not take place despite both fighters officially weighing in for the fight on Thursday. There is no word as of this writing as to why the fight did not take place. The win over Bobby Gunn for Roy Jones earned him the World Boxing Foundation (WBF) Cruiserweight world championship. Although it should be no secret to long time readers that I have been very vocal in my concern for Roy Jones’ long-term well-being over the years, he simply did what he had to do in a fight that he was able to dictate from the third round on and didn’t face much resistance in this fight. For the forty-eight year old future Hall of Famer, the victory was his eleventh in his last twelve fights and his third since suffering a brutal fourth round knockout loss to former Cruiserweight world champion Enzo Maccarinelli in December 2015. Since the loss to Maccarinelli, Jones returned to the ring in March 2016 where he faced Vyron Phillips in a bout where Phillips, an MMA fighter was selected as Jones’ opponent via an online vote. Phillips, who had never fought professionally as a boxer before was offered $100,000 if he could knock out Jones. Jones made quick work of Phillips stopping him in the second round. Jones then followed that fight by facing and scoring a ten round unanimous decision over journeyman contender Rodney Moore in August of last year. A fight that Jones dominated, but suffered a torn right bicep during the fight. Although the forty-eight year old Jones looked impressive in stopping forty-three year old Bobby Gunn, a fighter who is undefeated in bare-knuckle Boxing, but one who had not fought a fight under traditional Boxing rules since losing an eight round unanimous decision to former Light-Heavyweight world champion Glen Johnson in December 2013, one may wonder what options could be available to Jones coming out of this fight. Even though the opinion this observer expressed following his knockout loss to Enzo Maccarinelli has not changed and by all accounts Jones will continue fighting after this latest victory, I hope he will know when it is time to call it a career regardless of what options may be available to him. The official weigh-in for Friday’s pay-per-view card headlined by a twelve round Cruiserweight fight for the vacant World Boxing Foundation (WBF) Cruiserweight world championship between future Hall of Famer Roy Jones and former world title challenger Bobby Gunn took place on Thursday in Wilmington, DE. The official weights for the entire card are as follows. Main Event: World Boxing Foundation (WBF) Cruiserweight world championship – 12Rds. Roy Jones 197 1/2lbs. vs. Bobby Gunn 199lbs. Kanat Islam 154 1/4lbs. vs. Robson Assis 154 1/2lbs. Joey Tiberi 136lbs. vs. Bryan Timmons 138 1/4lbs. Olimjon Nazarov 119 1/2lbs. vs. Dagoberto Aguero 118 1/2lbs. Frank De Alba 130 1/4lbs. vs. German Meraz 129lbs. Lamont Singletary 204 3/4lbs. vs. Dan Biddle 214lbs. Edward Ortiz 162 1/4lbs. vs. Jeff Chiffens *157 1/2lbs. Henry Stewart 176 1/2lbs. vs. Martez Williamson 190 1/2lbs. Jones vs. Gunn takes place Tonight (Friday, February 17th) at the Chase Center in Wilmington, DE. The card will be televised in the United States on cable pay-per-view beginning at 9PM ET/6PM PT. To check for availability on cable please visit: http://www.indemand.com/event/boxing-jones-jr-vs-gunn/ The card will also be available worldwide on the Fite TV app for $24.99. The Fite TV app is available on the Google Play Store as well as the Apple App Store. For more information about Fite TV and how to cast content to your TV please visit: www.fite.tv. of East Dallas to find mentoring and discipline. Sartor while not looking pass his opponent looks forward to bouts ahead. “I’m really looking forward to 2017 and future endeavors for my career. be visible and advocate for the sport one fight at a time. Material and Photo Courtesy of: Majestic Raven Entertainment and CKO Promotions. Used with permission. For more information about Majestic Raven Entertainment please visit: www.majesticraven.com. The term “Prospect” is one that some might argue can at times place high and/or unrealistic expectations upon athletes throughout all of sports. One sport where the search for the next great prospect is never ending is the sport of Boxing. Of course, Boxing fans will always love seeing the top fighters in the sport competing against each other with the intention of determining who is the “Best of the Best.” Perhaps the best part of the sport for Boxing fans however, is to see fighters from the early stages of their careers as they begin to rise through the ranks. One such rising prospect is undefeated Jr. Welterweight Ivan Baranchyk. Baranchyk, a native of Amursk, Russia has gradually been generating buzz since debuting as a professional in June 2014. In just under three years as a pro, Baranchyk compiled an impressive record of 13-0, with 10 Knockouts, registering a career knockout percentage of over 70% in his career thus far. Although scoring knockouts in ten of thirteen professional fights may give the impression of a fighter that has not been tested, Baranchyk was taken as far as ten rounds in two of his four bouts in 2016 against previously unbeaten Zhimin Wang and veteran Wilberth Lopez. This set the stage for the toughest test to date in Baranchyk’s career as he made his 2017 debut on February 10th against fellow prospect Abel Ramos at the Buffalo Run Casino in Miami, OK.
Ramos, who entered the bout with a record of 17-1-2, with 12 Knockouts, has the kind of experience and style that this observer felt could pose a challenge to Baranchyk. In his lone defeat, Ramos was stopped by highly touted undefeated prospect Regis Prograis in December 2015. He had however, bounced back to win three bouts all by knockout prior to taking on Baranchyk, who was making the first defense of his United States Boxing Association (USBA) Jr. Welterweight championship. The fight did indeed prove to be a test for the twenty-four-year old Baranchyk as the twenty-five year old Ramos was able to control the early rounds by working behind a consistent jab, mixing in combinations, and making Baranchyk miss a good portion of his offense. What was impressive about Ramos’ strategy in this observer’s eyes was not only how effective he was in using his jab as the focal point of his offense, but more specifically how well he was able to control distance. Baranchyk however, would make his presence known late in the third round when he dropped Ramos when a flush overhand right that sent him down to the canvas. Ramos was able to get up and became the first fighter in my recollection to not become discouraged after being knocked down by Baranchyk as he was able to score a knockdown of his own with a counter left hook to the jaw that sent Baranchyk down with seconds to go in the third round. Ramos would again show his mettle in round four as he was sent to the canvas for a second time courtesy of a Baranchyk left hook to the chin. As the scheduled ten round bout approached the halfway point, it was clear that this was not just the first significant test of Ivan Baranchyk’s career, but also perhaps an early candidate for 2017 Fight of the Year honors. Although both fighters were able to score knockdowns of each other, it was a battle of Ramos’ effective Boxing ability and combination punching versus Baranchyk’s constant pressure and power punches, in my opinion. Although Ramos would continue to be effective in the second half of the fight, I felt that Baranchyk was more effective due in large part to his effective body punches and continuing to pressure Ramos back to the ropes, despite often having to walk through punches as he pressed forward. It was this approach that allowed Baranchyk to win an exciting ten round unanimous decision over Ramos to retain his USBA championship and remain undefeated in a fight that I scored 97-93 in his favor. This should be viewed as a development fight for Baranchyk in that he was not only tested by a fellow prospect, but also showed that he could get up from a knockdown and continue fighting. Although I feel that it would not be a bad idea for Baranchyk to face Ramos again based on how competitive and exciting this fight was, it will be interesting to see where Baranchyk, who is currently rated number seven in the world by the International Boxing Federation (IBF) in the Jr. Welterweight division will go from here. Even though I do not believe he is ready for an opportunity to challenge for a world championship, there are certainly options that could be available for Baranchyk coming out of this fight. Whether or not Baranchyk’s team opts to put him in with a top contender and/or a former world champion in the near future is a question that will be answered in time. Potential options such as former two-division world champion Rances Barthelemy, or top contenders like Antonio Orozco and Cletus Seldin, just to name a few could each pose an interesting challenge for Baranchyk as Ramos was able to do. With a USBA championship and a top ten ranking in one of Boxing’s five major world sanctioning organizations to his credit, it is clear that Ivan Baranchyk is approaching the stage where he will attempt to go from rising prospect to top contender. How quickly he will make the attempt is anyone’s guess, but as most prospects discover over time the competition tends to get tougher as a fighter continues to climb up the ranks. We will see if Baranchyk can continue his rise the next time he steps in the ring. The official weigh-in for Friday night’s ShoBox: The New Generation card at the Buffalo Run Casino in Miami, OK took place on Thursday. The card will be headlined by a ten round bout featuring current United States Boxing Association (USBA) Jr. Welterweight champion Ivan Baranchyk defending his title against Abel Ramos. The official weights for the entire card are as follows. Main Event: United States Boxing Association (USBA) Jr. Welterweight championship – 10Rds. Ivan Baranchyk (Champion) 140lbs. vs. Abel Ramos 139 1/2lbs. Lenin Castillo 177 1/4lbs. vs. Joseph Williams 178 1/2lbs. Ernesto Garza 126 1/4lbs. vs. Jon Fernandez 129 1/2lbs. *Other bouts scheduled to take place on this card. Official weights for these bouts are unavailable as of this writing. ShoBox: Baranchyk vs. Ramos takes place Tonight (Friday, February 10th) at the Buffalo Run Casino in Miami, OK. The card can be seen in the United States on Showtime beginning at 10:05PM ET/PT. Check your cable/satellite provider for time and channel in your area The card will also be available on Showtime’s Showtime Anytime and Showtime apps. For more information on ShoBox, Showtime Sports, and the Showtime Anytime and Showtime apps please visit: www.sho.com. We will have a recap of Baranchyk-Ramos on the website Tuesday, February 14th. One of the appeals of the sport of Boxing and by extension all of combat sports beyond the anticipation of fight between two world-class competitors is what may follow coming out of a fight for the participants involved. 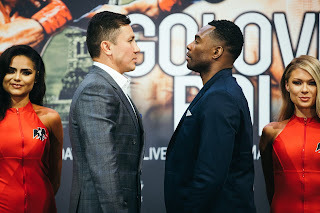 When it comes to fights that have a lot of back and forth action, no matter the outcome, it is natural for both Boxing fans and experts alike to almost immediately question in the aftermath of a “Great” fight is how long will it be before the combatants square off again. Such was the case when world champions Leo Santa Cruz and Carl Frampton met in July of last year for Santa Cruz' WBA Featherweight world championship at the Barclays Center in Brooklyn, NY. In what was a thrilling encounter that saw plenty of back and forth action, it was Frampton emerged victorious claiming his second world championship, after previously holding a unified world championship in the 122lb. Jr. Featherweight division, with a close majority decision over Santa Cruz. It was not long before discussion among both fan and expert alike began with regard to a potential rematch between the two. When periodically asked over the years for my opinion on what sets up the ingredients for a rematch, it is natural for this observer to look for circumstances as to why a rematch, particularly an immediate rematch should be made such as a controversial decision or stoppage. There are some occasions however, where demand for a rematch has less to do with subjects regarding potential controversy and more to do with what can happen when two great fighters are brought together to showcase their skills against each other. Sometimes it can be a simple matter of the two best fighters in their division, who treated the Boxing world to a classic the last time they fought, looking to prove themselves by facing that opponent one more time. The rematch between Carl Frampton and Leo Santa Cruz took place on January 28th at the MGM Grand Garden Arena in Las Vegas, NV. Much as was the case when the two world champions met last year, the second encounter featured several close rounds and there is likely a difference of opinion as to who was able to get the upper hand. Unlike the first battle between Frampton and Santa Cruz, the rematch was more of a tactical Boxing match rather than the thrilling back and forth encounter that was the story of the first fight. Whenever a rematch approaches an obvious question that goes through my mind is who will be able to make adjustments in the rematch compared to how the first fight was fought. In the first encounter between Frampton and Santa Cruz, it was Santa Cruz' overall aggression that dictated how the fight was fought. Despite Santa Cruz’ aggression in the first fight, Frampton was able to counter punch effectively and was able to land the more effective punches in action-packed battle. The rematch was again dictated by Santa Cruz, only this time he fought a more disciplined fight working behind a consistent jab, mixing in combinations, and generally getting the better of the action. Although Frampton was able to keep the fight competitive and was able to have his share of moments particularly during rounds that were predominantly fought on the inside where he was able to win some rounds, he was not as effective in his ability to counter Santa Cruz as compared to the first fight. This along with Santa Cruz’ effective lateral movement and angles gave Santa Cruz the edge, in my opinion as I scored the fight 116-112 or eight rounds to four in his favor. Even though as this observer has often said over the years a scorecard of 116-112 or 8-4 in rounds might give an impression of a fight that was lopsided in one fighter’s favor, it is important to remember that several of the rounds in this particular fight were close due to how effective Frampton was able to be when the combat was fought on the inside creating the scenario of “Swing Rounds” where not only one moment can sway opinion as to who won a round, but also create a difference of opinion among observers and more importantly the three official judges as to who got the upper hand. If one takes the scenario of possible “Swing Rounds” into account, it should be no surprise that much as was the case in the first fight, the rematch between Frampton and Santa Cruz was close in terms of the official scoring as two of three official judges scored the fight in favor of Santa Cruz in rounds by margins of 8-4 and 9-3 respectfully, while the third judge scored the fight 114-114 a draw resulting in another majority decision, this time for Santa Cruz, who with the win regained the WBA Featherweight world championship. A statistical breakdown of Santa Cruz’ effectiveness throughout this rematch as provided by ThrowdownScoring.com/CompuBox indicates that much as was the case in the first encounter, Santa Cruz, who threw 1002 total punches landing 255 of those punches in the first fight, was nearly as active in this fight throwing 884 total punches during the twelve round bout landing 230 for a total connect percentage of 26%. In contrast to the first fight where Frampton landed 242 of 668 total punches for a connect percentage of 36%, he was not as effective in the second encounter landing only 133 of 592 total punches for a total connect percentage of just over 22%. Although Santa Cruz was again the more active fighter in the second fight between the two, the primarily difference in a statistical sense in comparison with the first fight is Santa Cruz’ effectiveness with his jab as he landed 81 jabs in this fight compared to 64 in the first fight. The jab kept Frampton busy and he was simply unable to counter punch as effectively as he did the first time around. With Santa Cruz and Frampton each holding a win a piece and twenty-four rounds fought in two fights, the logical question is how long will it be before the chapter in this rivalry? Although it is possible that there will be some time between the second fight and a potential third encounter between the two, I believe that a third fight should happen at some point in the future. Although there likely remains a difference of opinion among both Boxing fans and experts alike as to who won the two encounters between the two, an ingredient that normally fuels demand for a trilogy, what has been noticeably absent have been elements of controversy, questions of potential corruption, and simply things that would be considered by most to be a black eye for the sport. What has instead been noticeable about the rivalry between Santa Cruz and Frampton is simply a respect for each other’s skill as well as “Class” and “Professionalism” being shown by both “Champions.” It is something that frankly the sport of Boxing could use more of. 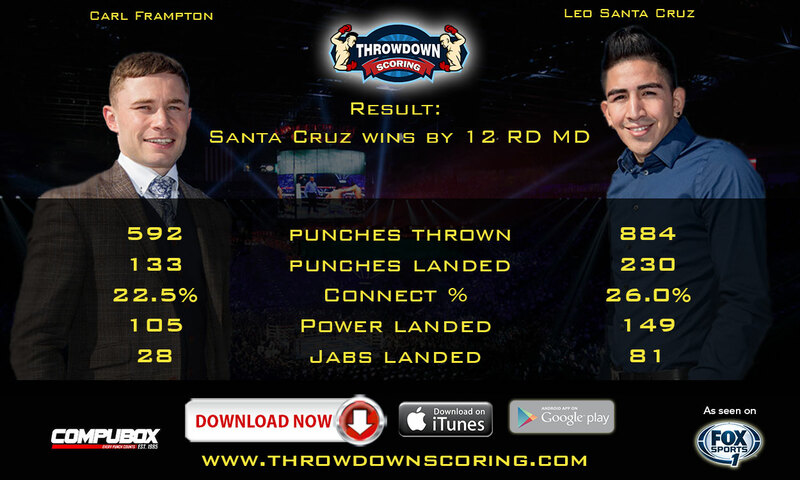 Frampton-Santa Cruz II stats and graphic provided by Throwdownscoring.com/CompuBox. Used with permission. You can score live fights by downloading the free Throwdown Scoring app on Google Play or on Apple ITunes. For more information please visit: www.throwdownscoring.com.